This question was asked yesterday during our Epiphany Sunday service. A young voice from the back of the room yelled out what we were all thinking. “Bethlehem!” he exclaimed as a chuckle when through the congregation. “Actually,” the pastor responded, “Jerusalem. The star led them first to Jerusalem where they spoke with Herod.” (check it out at Matthew 2:2). I’d never considered this part of the story before. You might say, I had an epiphany. You see, the wise men saw an unusual star rise in the East and felt it had enough significance to warrant a costly and timely journey towards its location. We naturally skip to the end of the story, but in doing so we miss a significant middle portion. The first place the star led them was not the Messiah. As a matter of fact, it led them to a corrupt king, intent on securing his reign and filled with evil intention. But this corrupt king was actually the one who pointed the wise man towards Bethlehem, back towards the rising star and ultimately towards Messiah, Jesus, King of Kings and Lord of Lords. God didn’t have to add this little bump in the road. He could have just led them directly to a stable in a little town in Judea. But for whatever reason, God sent them on this little detour first. Ever been following God’s calling on your life or implementing a plan you really felt His leading in and.. bump… oops… how did we end up here? Has your “star” taken you to a place that is definitely not what you were looking for? We usually label these bumps and detours as “failures.” And sometimes, when that happens, we stop the journey. We assume we heard wrong, said wrong, and did wrong. We make the U-turn back to where we started and we analyze how it was we could have been detoured so badly. But what if it wasn’t a mistake? I can’t help but wonder what would have happened if the wise men arrived at Herod’s palace and said, “This?!? This is what we came for?” and then turned around and headed home. And their persistence paid off. They were given direction and insight from those who understood the situation better than they did and they saw that star rise again and lead them straight into Emmanuel’s dwelling. If you find yourself detoured and landing in a place you didn’t anticipate as you lead your ministry, your home or your own life, don’t be so quick to say, “I must not have heard God right.” Instead, try these three wise moves like our magi did. Pause long enough to take in your surroundings – The voice of failure can be loud, but the quiet voice of the Lord can be overwhelming. Be still enough to know that He is God. Then, listen to the other voices. Ask what needs your families don’t feel are being met, inquire of your family why they don’t feel comfortable participating in faith talks, or consult your fellow students or professors about where you could improve academically. Often God clarifies His leading in our lives through the people He puts in our path, even the detours. Let God restore your vision – At some point, after talking to Herod and the scribes and staying for a time in the palace, the wise men had to once again turn their eyes to the sky and lo, and behold, when they did “the star they had seen when it rose went ahead of them.” God resumed the journey, this time with deeper understanding and clarity and this time to the final destination. Maybe your intergenerational service will take on some new characteristics or your family faith talks might play out differently than you assumed or your academic expectations may need adjusted, but when we follow God’s leading and lift our eyes to Him, He will lead us right into His presence. A speaker I once heard (Pastor John Stumbo, President of Christian & Missionary Alliance Church) said, “Where you see a period, God sees a comma; He’s not done writing your story yet.” If you find yourself detoured and wondering how you ended up there, assume it’s a comma and learn from the moment. He’s not done writing your story yet either. Happy Epiphany friends! I find that this day a great time to reflect on where we seek Jesus and how He still leads us today. 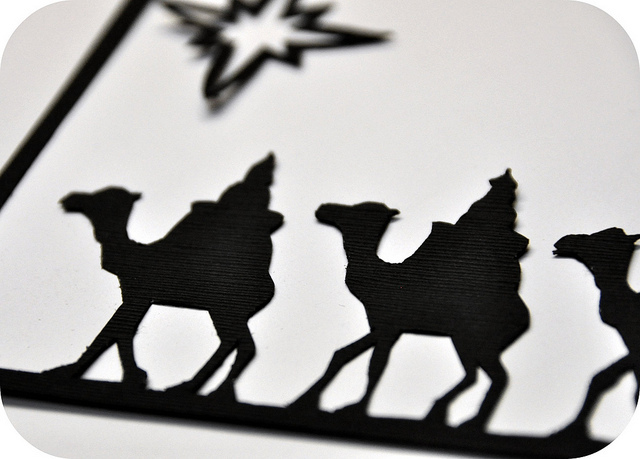 I’ve become more appreciative of the wisemen’s journey of faith as I’ve grown in my own. There are detours, but ultimately leading to the best destination. If you’ve ever wondered how you “ended up” somewhere when you thought God was leading you somewhere else, perhaps you will find some encouragement here! Blessings!